ID: White/green body with short white spines. 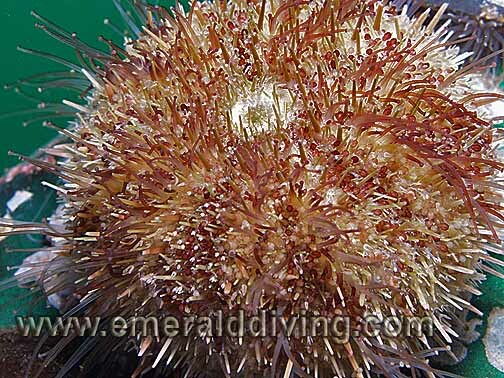 Comments: I typically note this short spined urchin in shallower areas where broadleaf kelp grows. My observations are that the green sea urchin is the most widely distributed and numberous species of sea urchin in our waters. ID: Maroon/purple body with long purple spines. Comments: I only note the purple sea urchin around rocky substrates that harbor kelp in the Cape Flattery area, Strait of Juan de Fuca, and San Juan Islands. Urchins have been overharvested im many areas to the point where they don't exist in certain regions. Comments: I usually note the red sea urchin anywhere I find the purple sea urchin. Sea urchins at some locations have been completely wiped out due to overharvesting. 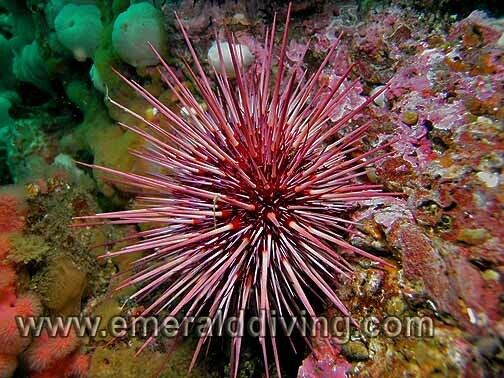 Sea urchins are an important member of the food chain as they help keep kelp growths under control. ID: White spines, flattish body. 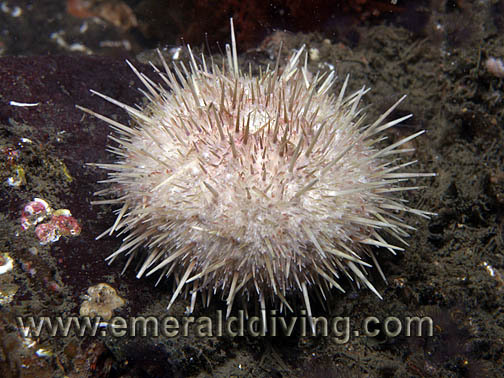 Comments: This sea urchin can be very hard to discern fro the green sea urchin, especially when it gets larger. 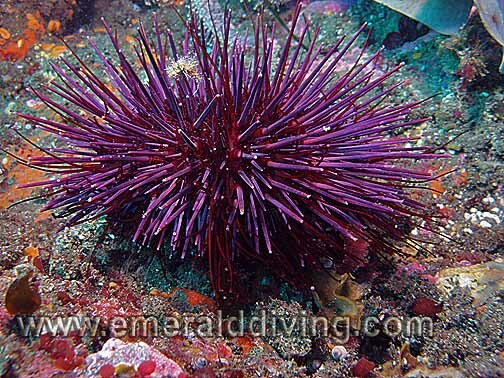 It has a flatter body than the sea urchin, but often co-exists with it's greener cousin. Photographed at Peapod Rocks in Roasario Strait amidst a colony of green sea urchins feeding on kelp.